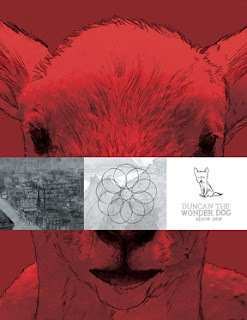 I wrote about Duncan the Wonder Dog, the inaugural Lynd Ward Graphic Novel Prize winner recently and have tried to acquire either a reasonably priced first printing or a 2nd printing since I really want a copy. I have failed at both attempts. I am not willing to pay the asking price for a first printing at this time, expecting more copies will become available and the price will drop ( a supply demand dream). I did try to order the announced 2nd printing and just learned yesterday that none of the three stores I placed an order with could deliver a copy. The 2nd printing is sold out. Luckily, I'm heading to New York City to attend the New York Antiquarian Book Fair, April 8-April 10. While I doubt I'll find a copy of Duncan the Wonder Dog reasonably priced at the Fair, I am holding on to the small hope that I may stumble upon a copy while visiting various book shops in Manhattan. Amazon Affiliates are selling copies but Amazon has no stock at cover price. I had a copy on backorder but the line was long and I was denied! Wow! I'm basically impressed by the way you detailed out just about almost everything. It's definitely http://techfreakz.com/mobiles/customize-your-ringtone-and-notification-sounds-in-android-o/ going to assist me a fantastic deal. Thanks for sharing your thoughts so clearly.